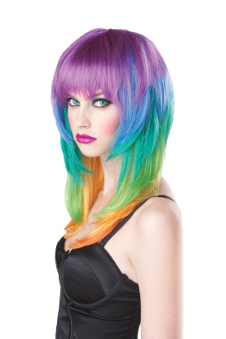 This Kaleidoscope Wig lives up to its name with a riot of colours in this blunt fringe, layered and shaped wig. Wig only, shirt not included. Rock this wig with attitude, its bright, funky, colourful and will definitely stand out in a crowd.